Along with quite a few other media outlets, the New York Times has published an article highlighting much of what’s wrong with the music industry. The stories are all on the opening act for the Eagles’ concerts at Madison Square Garden. The opening act for a classic rock band that’s been resting on it’s laurels for decades is not normally noteworthy. In this case, it’s not the opening act’s music that is important but rather who the leader of the opening act is. The band is led by none other than James Dolan, of the Dolan family that controls MSG as well as the New York Knicks and New York Rangers. The Dolans are infamous for running the sports teams into the ground and jealously protecting the various deals that allow MSG to have a near-monopoly on major sporting and music events in Manhattan. They even run a terrible cable company – not that there’s any other kind. While most stories about the corruption and failures of the music industry focus on the labels, this is a story that shows the problems with the venues that control larger concerts and festivals. The Eagles are a very famous band that can sell out huge arenas. Opening for them gives a band exposure to tens of thousands of listeners, so promoters should want to book a regionally popular or up and coming act so that the audience can be guaranteed a performance with a reasonable expectation of quality. This is not what happened in this case. Instead, MSG booked a band led by its own Executive Chairman. This is problematic for many reasons. It appears that as a middle-aged, extremely wealthy corporate executive, James Dolan decided that he wanted to pretend to be a rock star. He, of course, fronts the band, which is likely made up of hired session players. The whole thing seems like it’s purely a vanity project meant to fuel Dolan’s undoubtedly colossal ego. Dolan even claims to have hired Mick Jagger’s vocal coach — not that it shows in his music. By owning a venue, Dolan gets to perform in front of a huge audience without ever earning the privilege of doing so. He uses the Eagles’ fame to force the rest of us to hear about his band. Another problem with this is that bands make money off of concerts. By placing his own band as the opening act, Dolan deprives a more deserving band of a chance to get more exposure and make some money. Nearly all bands struggle with money issues, so Dolan’s vanity project ends up hurting the many bands that are just trying to stay alive long enough to get noticed. Dolan also gets to make even more money off the audience than he normally would. The MSG company will get much of the ticket revenue, and Dolan (and maybe the rest of his band depending on their contracts) will get merchandise revenue and maybe some more ticket money. Finally, none of this would be that much of a problem if the band were good. It’s not. The backing musicians sound reasonably competent, but play some of the most soulless, unoriginal music possible. The lyrics are embarrassingly lazy and Dolan does not have the kind of vocal skill needed even for the pseudo-bluesy soft rock played by the band. It honestly sounds almost like Dolan is singing over MIDI backing music from a karaoke song. If Dolan just wanted to have some fun playing music that would be fine. Inflicting his music on everyone else is where it becomes objectionable. It’s fitting that James Dolan’s band is opening for the Eagles: a bored multimillionaire’s insipid ego-driven vanity project opening for the paragon of bland, inoffensive corporate money-making rock juggernauts. I’ve already gone over some of the main pieces of evidence for the existence of dark matter. There are also a lot of more indirect reasons why we think dark matter should exist. I’ve already mentioned these in earlier posts, but here are some of the other measurements and models supporting the dark matter hypothesis. Using a model of the universe assuming the universe started in a very hot and dense state that expanded adiabatically, we can estimate the relic abundances of the lightest few isotopes, which are mostly produced here rather than in the centers of stars. The abundances (typically ratios rather than absolute abundances) of objects thought to have compositions close to what’s left after BBN have been measured and have been found to match predictions quite well. There is some disagreement on lithium-7 but the lighter isotopes match predictions from BBN models. While this doesn’t necessarily tell us that dark matter exists, it does help validate our model of the early universe. It also helps to further challenge models where the “dark matter” is really just some regular matter that we aren’t measuring for some reason. Large structures in the universe are believed to have coalesced out of small primordial density fluctuations. Matter is pulled into regions that start with a slight overdensity, leading that overdensity to keep increasing in magnitude. This eventually leads to dense (compared to the average density of the universe) objects like galaxies, clusters, etc. It turns out that simulations suggest that a universe containing only regular matter will not lead to the structures we see in the universe. The clumps of matter will not form quickly enough. However, if the mass overdensities are made of dark matter, large gravitationally bound objects will form properly. The dark matter provides mass to increase the gravitational forces in these overdense regions but does not clump into compact objects. The compact objects are made of baryonic matter trapped by the dark matter’s gravitational forces. 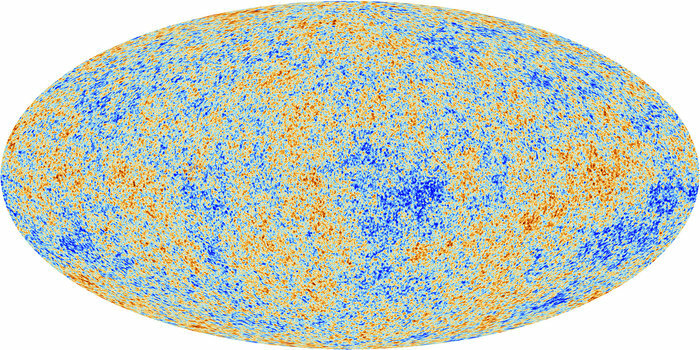 Skymap of temperature fluctuations in the cosmic microwave background measured by Planck. Credit/copyright: ESA and the Planck Collaboration. The CMB is the result of the photon-baryon fluid in the early universe (at a redshift around 1100) becoming transparent to photons. When the universe cools sufficiently, the baryonic atomic nuclei start capturing electrons, changing from charged ions to neutral atoms. This means that there are no (or at least few) charged particles left, so photons, which couple to electric charge, have trouble interacting with anything. The photons then are able to continue on without interacting with anything until we measure them billions of years later. The photons follow the standard blackbody spectrum, which is then redshifted until today where the spectrum corresponds to a temperature of 2.7 K (a few degrees above absolute 0) and peaks at microwave wavelengths. The CMB is not uniform in the sky. It’s temperature is seen to feature tiny fluctuations in space. These can be seen as relics of oscillations in the photon-baryon fluid (to lowest order the different oscillatory modes do not interact with one another). The power spectrum tells us the strengths of these different modes. The properties of the modes (basically the size of the temperature fluctuations on different spatial scales) are related to the properties of the photon baryon fluid. So, we can extrapolate the composition of the early universe from the CMB power spectrum. Fits of a generic early universe model to the measured power spectrum show that a large fraction of the energy content of the early universe (and the current universe) appears to be from non-relativistic, non-baryonic dark matter. Measurements of other things such as Type Ia supernovae (a popular standard candle) help us refine our model, and everything points to the existence of dark matter.